It will be blindingly apparent from the moment you first encounter the Bull Buck sequoia - particularly if you arrive via the more dramatic anticlockwise trail approach - that this is a tree among trees. Well, obviously, but I mean a TREE among trees. An arboreal amazon, a coniferous colossus, a barky behemoth. First Team All-Tree. 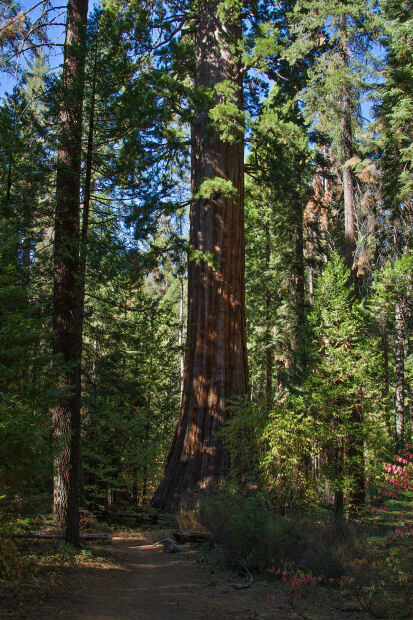 It's taller (246 vs. 209 feet) and slightly larger around at the base (99 vs. 92 feet) than the Mariposa Grove's famous Grizzly Giant, and according to a nearby sign, nearly a millenium older (2,700 vs. 1,800 years) - though the sign dates from 1975 and the Grizzly Giant's estimated age was reduced from 2,700 to 1,800 years around the turn of the century, so the Bull Buck may be due for a reappraisal as well. The Bull Buck Tree is not only humongous and humongously old, but also serves as a sort of platonic ideal of tree aesthetics, pleasingly proportioned with a nicely arranged selection of bark, branches, and leaves, providing the kind of profile that any sky would feel flattered to have rising in front of it. You get the sense, gazing on it, that this is what other trees should aspire to. If you count yourself a looker-at of trees, in short, this one belongs on your list.